Jean Truchon and CHSLD psychologist Suzanne Malo. Afflicted with an incurable degenerative condition, Jean Truchon says he considered all possibilities to end his life, including starvation, drowning and a lethal overdose. He ruled them out and is instead in court challenging provincial and federal laws that have left him ineligible for a medically assisted death. "For me, I died in 2012," he told Justice Christine Baudouin. He cried as he described his life in the care facility and the loss of dignity he feels. Truchon and Nicole Gladu, who suffers from post-polio syndrome, do not qualify for the procedure because they are not considered to be at the end of life. Under federal law, natural death must be "reasonably foreseeable" before someone can receive medical assistance in dying. The Quebec law similarly says people must "be at the end of life." 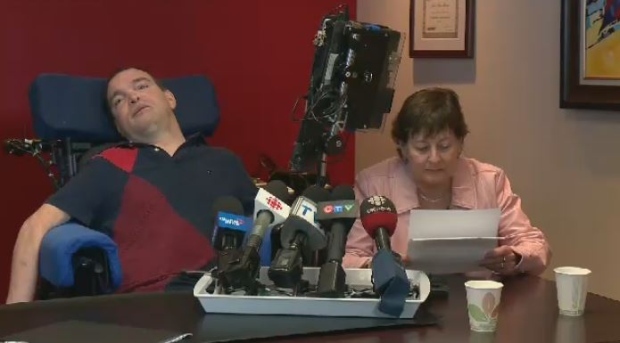 Truchon and Gladu are asking Quebec Superior Court to invalidate the criteria in the federal and provincial laws that blocked their requests and to allow them to receive medical aid in dying. Truchon said no doctor can predict how many years he has to live, but he wants to make the decision himself. "You don't have to be at the end of life to feel intolerable pain," he told the court. 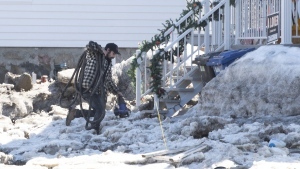 Jean-Pierre Menard, the lawyer representing Truchon and Gladu, said there are many Quebecers in the same situation as his clients. "We have to demonstrate before the judge what it is to suffer ... to show that it affects real people who are really suffering and who want to be done with it," he told reporters outside the courtroom. He plans to argue that Charter protections of the right to life and security as well as the right to equality have been infringed. The trial is scheduled to last 33 days. The federal attorney general will argue that the requirement of a "reasonably foreseeable" natural death is necessary to strike a balance. Otherwise, it argues, a message would be sent to vulnerable people that life is not worth living. The Quebec attorney general will argue that the "end of life" requirement is sufficiently flexible and leaves the decision in the hands of physicians. Gladu testified Monday that she contracted polio at the age of four, and it plunged her into a four-month coma. She managed to recover and build a successful career in journalism and government before it was interrupted by the effects of post-polio syndrome.